This is a great one, made for me and for you and for everybody and all sorts of occasions. It's light but substantial, delicious served hot or cold and will travel relatively well so prepared in advance in summer it's a terrific picnic hamper filler whilst conversely in the cold months it can be a warming apres ski tummy filler! Alternatively it makes a terrific vegetarian Sunday brunch dish or dinner party starter. 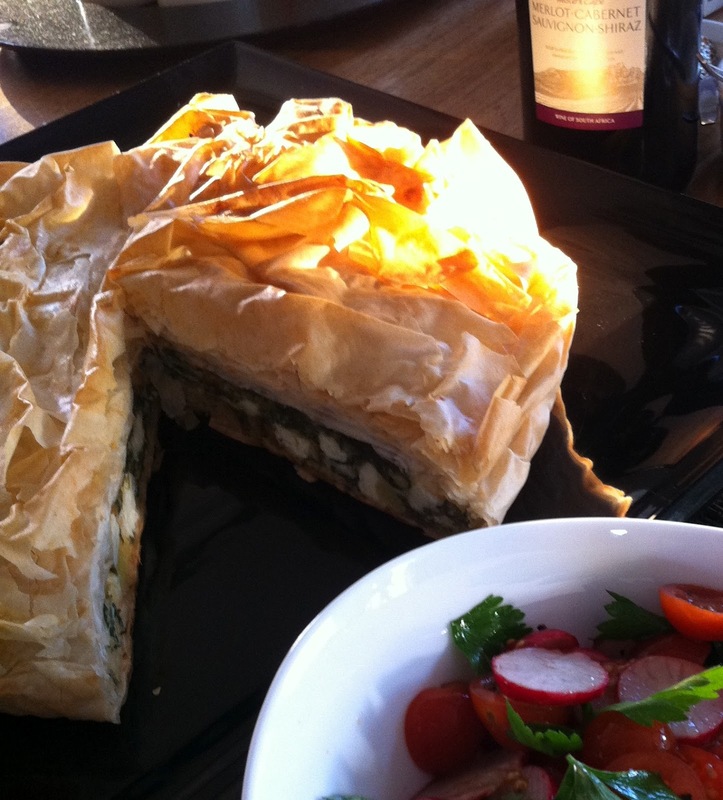 This dish is adapted from a filo tart chef Jamie Oliver did on his TV programme "30 Minute Meals" in which he cooks several dishes inside half an hour, so as you can imagine from the title it's easy and quick. We generally serve it with a refreshing salad such as radish and cherry tomato with coriander and parsley. Melt butter and brush the inside of a medium sized frying pan. Line with baking paper so that the paper is well above the sides of the pan and brush again with butter. Meanwhile sweat down the spinach in a little butter or olive oil until wilted. Drain, being sure to squeeze as much water out as possible. Separate and mix with eggs, feta, nutmeg, spices, pine nuts and sultanas (if using) and season to taste. Take the filo from the fridge and cover with a damp cloth. (Note: Some brands are best worked on at room temperature so check the instructions) Take one sheet at a time and place in the pan so that the edge overlaps the side and brush with butter. Repeat until most of the sheets are used up. Now add the filling and fold over the sheets to form a top. Crumple the last few sheets and use to form the top. Brush with butter to achive a nice golden colour. Heat the frying pan on the hob to start cooking the base then place in the oven for about 25 minutes or until nicely coloured. Remove from pan by holding the baking paper and slide the tart onto a serving dish. Serve hot or cold.